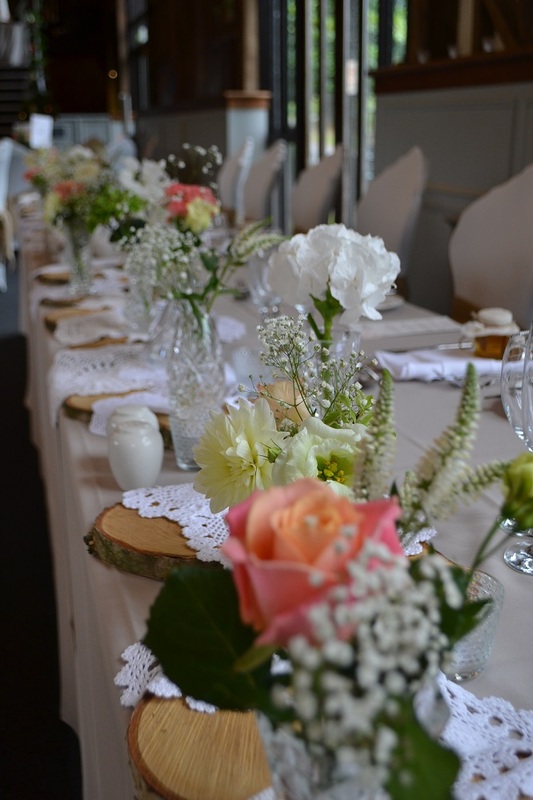 We have definitely seen an increase in the vintage and rustic styling of weddings in the last year. 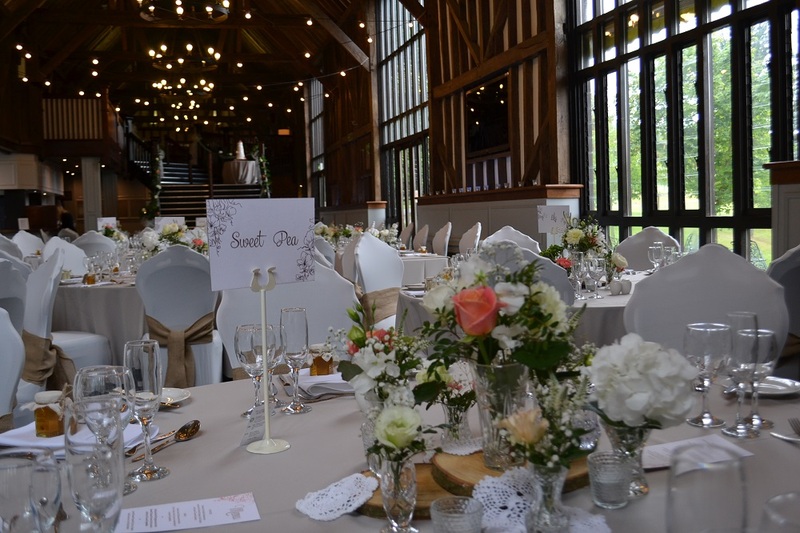 This wedding is a really beautiful take on the rustic romantic style with mix and match cut glass vases highlighted with wood and lacy accents. Catherine and Anthony married at the Immaculate Conception and St. Joseph Church in Hertford, before moving on to Essendon Country Club to celebrate their wedding. 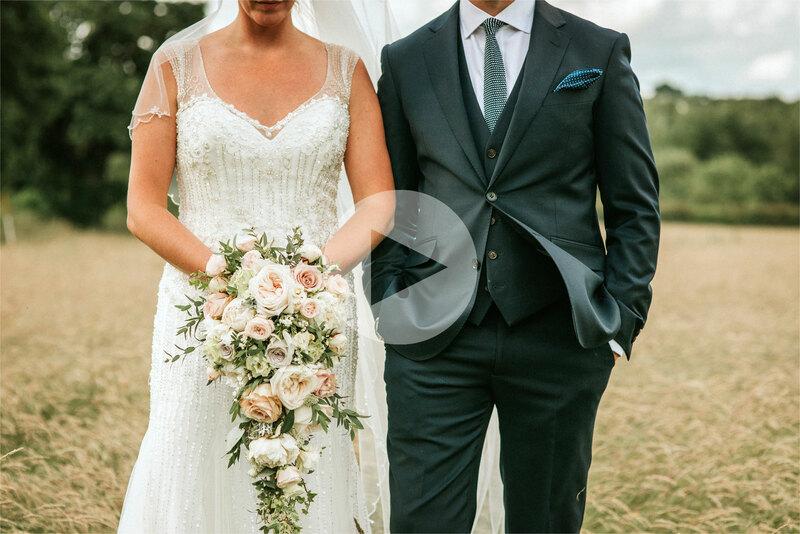 When Catherine met with us, she had a very clear vision of what she wanted their big day to look like. Her bridesmaids were wearing a beautiful coral dress which was shorter in style and had a more relaxed feel, which she wanted to see echoed in the flowers and the styling for her day. For her bouquet Catherine wanted a hand tied posy, nothing too big, but something that had a loose natural style to it, made up of flowers in coral tones. 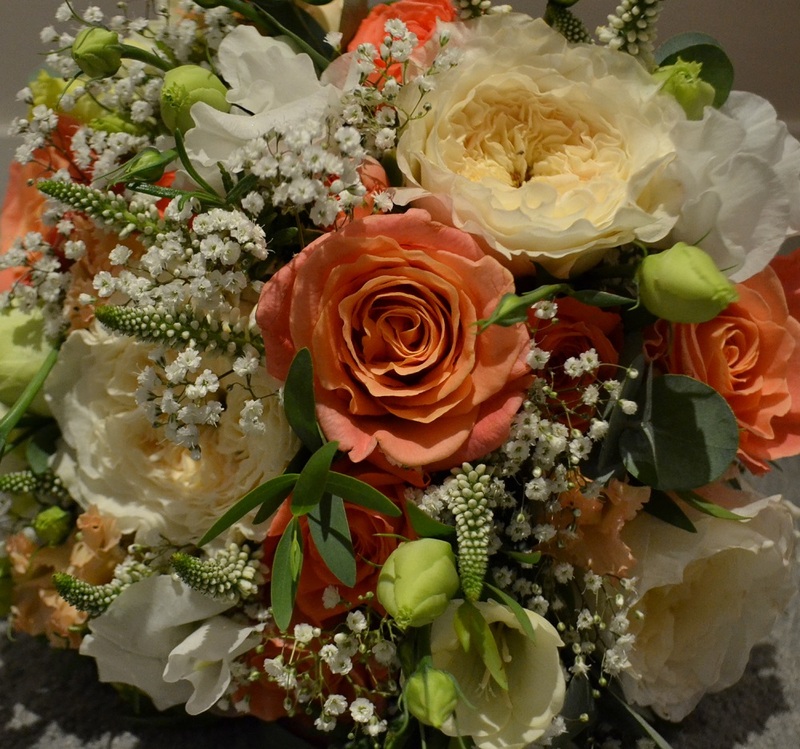 We chose the fuller, blowsier garden rose, mixed with coral roses, spray roses, gypsophilia, ivory colour freesia and mint green lisianthus, to off set the coral colour. We also used the spiky looking white veronica to add to the ‘messy’, natural style of the posy. To add to the rustic look, the stems of the bouquet were wrapped in garden twine and finished with wooden buttons (sourced by Catherine). 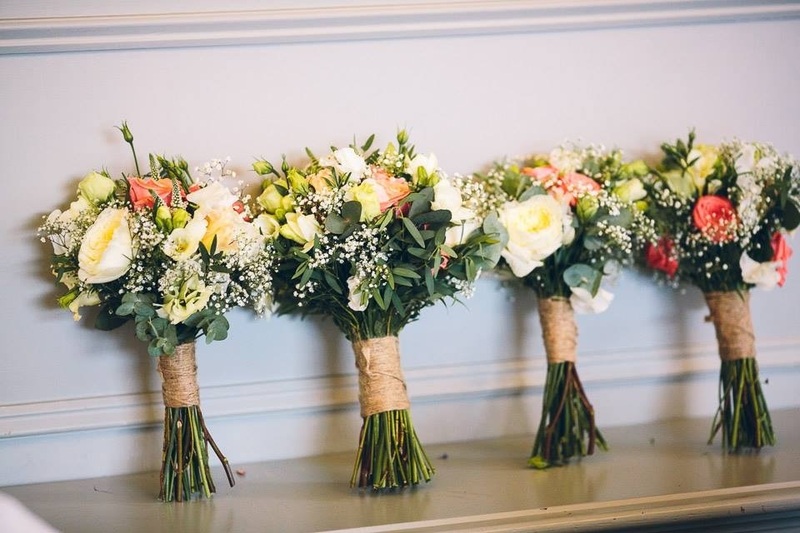 The bridesmaids’ bouquets were very similar to Catherine’s in styling, but the colours were more predominately ivory with coral accents and slightly smaller. The button holes for the men were the coral coloured roses, with the grooms made a little more distinctive with the addition of gypsophilia, freesia and garden twine to finish off the look. 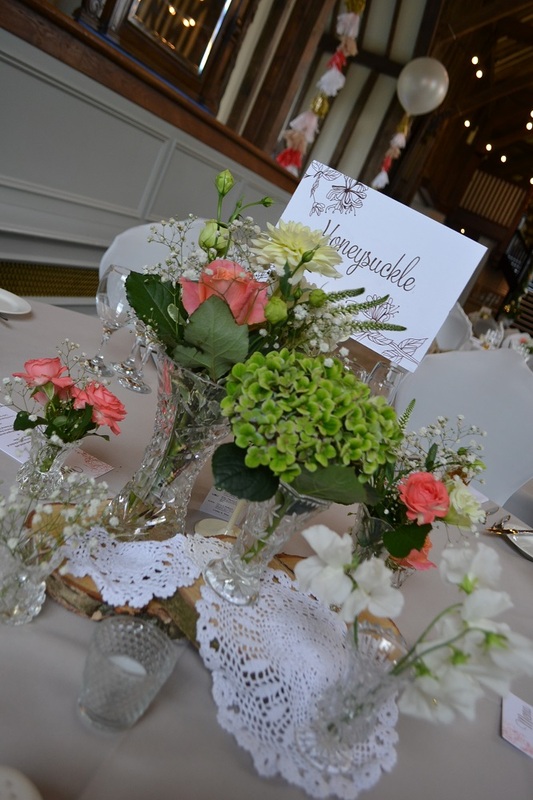 For the décor in the reception space, Catherine gathered together a mixture of cut glass vases which she wanted displayed on slices of wooden logs and crocheted dollies. 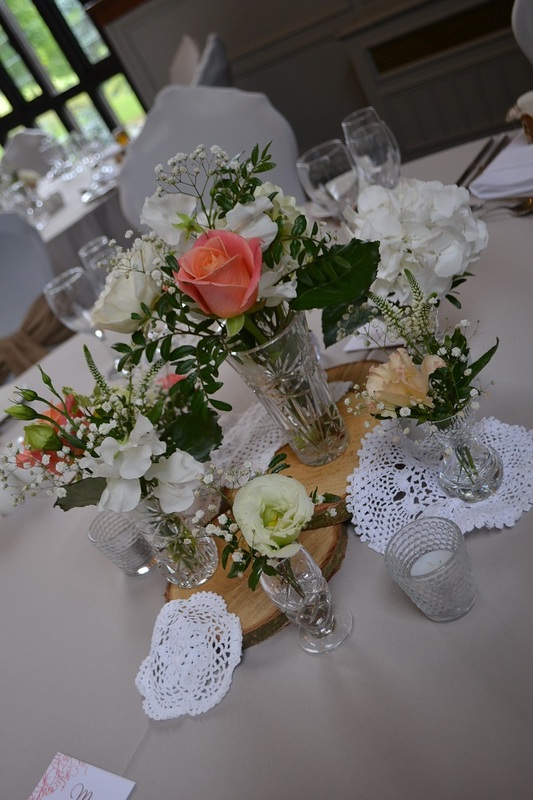 The vases were filled with loose mixed arrangements or masses of individual flowers, including green hydragenia, dahlia and sweet pea, along with the coral roses, freesia and gypsophilia, in keeping with the brides bouquet and button holes. The vases were interspersed with tea lights and were a mixture of sizes and flowers on each table. 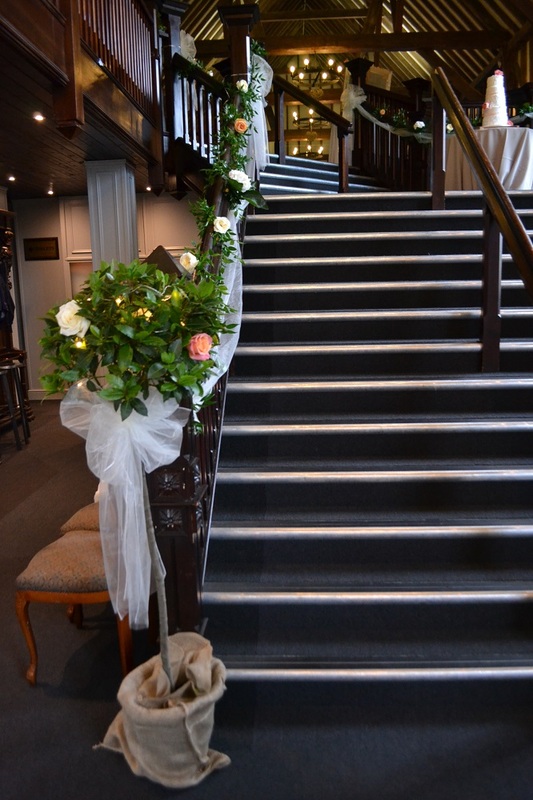 Essendon Country Club has a beautiful staircase leading in to the reception room which the couple requested that we dressed with a garland of soft ruscus, incorporating ivory coloured swags of fabric and bows and scattered with wired roses. The look was finished off with our bay trees, lit with fairy lights and featuring roses, finished with a hessian dressing around the base.